Hello out there- thanks so much to all who participated last week in our dialogue on the rosary... I was definitely inspired by many of the comments. Remember, to view comments click on post a comment. Please keep sharing your thoughts with us! In addition to our weekly question, we love to get feedback on the other posts as well. The question being posed this week is one about prudence vs. charity. Growing up in Vermont, rarely did I see homeless people because it was so cold, I presume. However in California I see them fairly regularly. Most ask for money, some are just bumming around, some seem mentally ill, and others just regular people who are homeless for whatever reason. Every time I see them I am struck with two opposing instincts- one is to protect my children and hurry past, the other is to think of the gospels and embrace them, thinking how Jesus loved the poor, the unwanted, and spoke of charity regarding them- giving two coats is it? Or something like that. My question is this: When you read the lives of the saints, they often had a love for the poor, that was taught by a parent even, yet in this day in age can the same ideals apply? 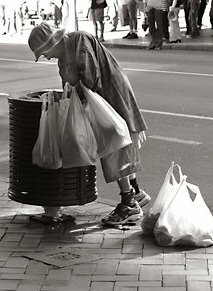 As true Christian women and mothers, what is the appropriate yet charitable way to interact with homeless people? How can we love them?